Toxic Certainty occurs when a person (or group) develops an unshakeable conviction in his/her interpretation of the facts and decision-making, and is immune to contradictory information. We see the negative effects of Toxic Certainty in political gridlock. We recognize it in religious extremism. 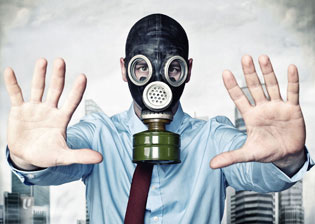 But often Toxic Certainty goes unnoticed when it occurs at headquarters or in the boardroom. Unnoticed, that is, until disaster looms as a result of misguided thinking and actions. Remember Custer’s Last Stand at the Battle of Big Horn? Custer was convinced that his Seventh Cavalry could handle any Indian force. He declined additional troops and made other errors in planning his strategy. But what really sealed Custer’s fate was his refusal to change tactics during the battle. Toxic Certainty is deadly to a leader’s success because it involves more than just over-confidence in a workable solution. Rather, it involves an unshakeable belief in a solution that is erroneous at its core. Denial plays a role in Toxic Certainty, since the affected leader refuses to consider alternative scenarios or interpretations, and will not or cannot process disconfirming information. I frequently describe Toxic Certainty with the phrase, “When Believing is Seeing.” Here are key features and indicators of this all-too-fatal success trap. Initial faulty interpretation. Toxic Certainty typically begins with a flawed assessment or diagnosis of the situation. Often the susceptible leader seeks out data and patterns that are familiar to him/her and to past professional successes. This can happen consciously or unconsciously. Once a pattern is recognized – whether it actually exists or not – further fact-finding is either discontinued or limited to data that supports the pattern. Or the leader may move quickly on incomplete information which does not show a true picture of the situation. What matters is that the Toxically Certain leader gets off on the wrong foot. Subsequent refusal to consider disconfirming or contradictory information. The Toxically Certain leader cannot or will not modify course in light of new or better contextualized data. Some variation of “Don’t confuse me with facts” is the person’s reaction to poor results. Naysayers in the organization are shown the door or marginalized. Personal over-investment in a decision or course of action. Stock market investors know the pain of remaining emotionally attached to underwater stocks instead of cutting their losses. Leaders with Toxic Certainty suffer from a similar problem. Whether the leader fears embarrassment, loss of face or the appearance of weakness, he/she finds it difficult or impossible to acknowledge mistakes and errors in judgment. Rather, they are likely to dig in deeper, committing more resources to the failing initiative or project. Bottom Line: Toxically Certain leaders have stopped learning! For business cases of Toxic Certainty, we have only to look at Kodak’s devastating decline as digital photography wiped out its film business. Having invented the digital camera in 1975, Kodak’s leadership nonetheless stuck with their old technology (and revenue stream) and lost. The company emerged from a 20-month bankruptcy last year. Similarly, in 2011 the Board of J.C. Penney hired Ron Johnson as CEO to transform the staid department store retailer. Johnson, formerly an executive at Apple, proceeded to turn the company inside out without bothering to test his marketing and sales strategies on actual customers. Even after sales revenue plummeted in a big way, he maintained that he knew best. Sixteen months and nearly one billion dollars down the drain, Johnson was shown the door. Once a person or group is in the throes of Toxic Certainty it can be impossible to wrest them free. The smart course is to prevent Toxic Certainty from taking hold in the first place. Planning. Take an evidence-based approach to planning and risk management. Develop metrics and a decision review timeline for all major initiatives before beginning them. Test assumptions and innovations with simulations, pilot studies and focus groups before diving off the deep end of the pool. A robust system will enable you to monitor risk/reward and have firm criteria for proceeding, adjusting course or cutting losses. Hiring. Boards of Directors have a tough job when hiring outsiders to run their organizations. This job is even more difficult when it entails a major reorganization or transformation. In the selection process, directors should focus not just on the candidates’ successes to date but on how they handled failure. How flexible are they in their thinking? Which skills and experiences are actually transferable to the new position, and which ones might actually be limiters? Culture. An organizational culture that supports “healthy failure” is critical to preventing Toxic Certainty. Just as programmed computer trading takes the emotion out of investment decisions, a strong culture of critical analysis, debate and continuous learning takes the sting out of otherwise ego-denting decisions and actions. Leaders are paid for their judgment. A confident, resilient ego is necessary to accomplish the job. But it needs to be an ego in check. By the same token, having a system of checks and balances in place – in the executive suite, the boardroom and the finance department – is an effective way to promote brilliant execution and keep Toxic Certainty at bay.